How many people can watch Sling TV at once – Sling TV is one of the popular on-demand video streaming service for the US. We call it as Over the Top which means we are not gonna use any cables to get the content. Content will be streamed over the internet. There are many more OTT (Over the top) services emerged into this space over the few years. Sling TV is similar to Netflix, YouTube TV, Hulu etc. All these are well established platforms where as Sling TV is entered into this marked very recently. However it become one of the top player in this market. We can use Sling TV as a direct replacement to traditional satellites or cable networks. So here in this blog post, we will let you know the details about Sling TV and then how many people can watch Sling TV at once? Sling TV is unveiled on January 2015 by Dish TV network to compete with the traditional local cable networks. One of the best thing about online streaming services is we can customise whatever we really want to watch and cut down all the remaining stuff. We can’t do the same thing in local cable networks and we often end up paying high fees than we use. Now to answer the question- how many people can watch Sling TV at once, we need to check through their different plans and offerings. 2 How many people can watch Sling TV at once? How many channels does Sling TV have? This is the one of the common question everyone who wants to switch would ask you. Sling TV offers you wide range of channels in three different plans. There are even customisation available for you to choose the specific channels as add-on packages. Here we will listing all the plans and channels available in Sling TV. Let’s dig down deep to know more about the different offerings of Sling TV and How many users can watch Sling TV at once with each of these plans. Sling Orange is an entry level plan available with Sling TV. However there are wide range of channels made available to you on Sling Orange plan. Currently there are 28 channels available in Sling Orange plan. If you are a sports lover, then Sling Orange is the perfect choice for you. It has all the ESPN sports channels including ESPN1, ESPN 2 and online only ESPN 3. Other major channels includes Discovery, AMC, TBS, CNN, Cartoon Network, TNT, IFC, Disney Channels etc. You can avail 7 days free trial for this plan. Coming to the number of simultaneous streams, you can watch only one stream at a time with Sling Orange package. If you want to use more than one devices at a time, better you checkout to Sling Blue package. Sling Blue is another best package with Sling TV. It has around 42 live channels you can watch with Sling Blue. Sling Blue plan has best channels like Discovery, FX, Viceland, EI Rey etc. However it doesn’t includes Disney and ESPN Sports channels. Few of the channels that are available in Blue pack are not in Sling Orange. So if you have a specific channel you want to watch, then do check in which plan it is included. Similar to the Orange plan, you can avail 7 days free trial with Blue as well. There is a huge advantage with Sling Blue plan for number of simultaneous streams. Yes, Sling Blue plan allows you to stream through up to 3 devices at once. So answer to How many people can watch Sling TV at once with Sling Blue package is three. This is a good option to share one Sling TV account with family. 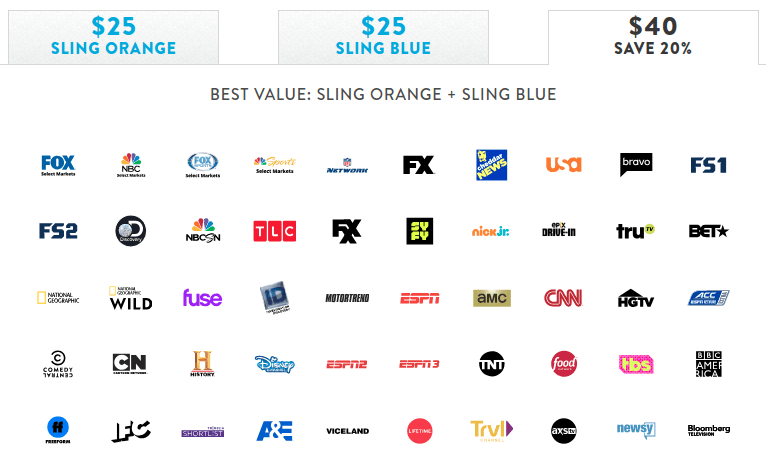 Sling TV offers a bundle pack which includes both Sling Orange and Sling Blue channels. You can save up to 20% if you choose for Sling Orange + Sling Blue package. You can watch Disney Channels, ESPN Sports, NBC, FS1, FOX, National Geographic, CNN, BBC America, HGTV, Bloomberg, Discovery channel and many more. As you have taken bundle plan, you will get four simultaneous streams access – Three streams with Blue plan and one with Orange plan. Together you can watch up to four simultaneous streams without any issues. In addition to these packages, Sling TV offers many more customised channels as add-on packages. You can buy Comedy, Cloud DVR, Kids, Sports, News, Life style, Locals, Premiums, Hollywood and International as add on packages and customise your plans. Cloud DVR Plan costs you $5/month and it allows you to watch and record live TV programs anytime. You can skip commercial ads and record multiple shows at once with this add-on. It is very useful for offline viewing. Similarly there are best options available for Sports and Comedy sections as well. So to answer your question – How many people can watch Sling TV at once or how many devices or streams with Sling TV, it actually depends on the plan you have subscribed to. Number of simultaneous streams you can watch will vary based on your purchased package. We have already seen different plans available with Sling TV and How many streams you can watch with sling TV. Let’s summarise it once again. With Sling Orange Plan, you watch only one stream simultaneously. So if you have subscribed to this plan, you can watch on only one device at a time. Any of the extra add-on also will have single stream only. If you try to stream on another device, it will throw an error saying multiple streams are playing with the account. If you have shared Sling TV credentials with any of your friends, then you will face this issue often. So it is recommended not sure share Sling TV credentials if you are subscribed to Sling Orange package. 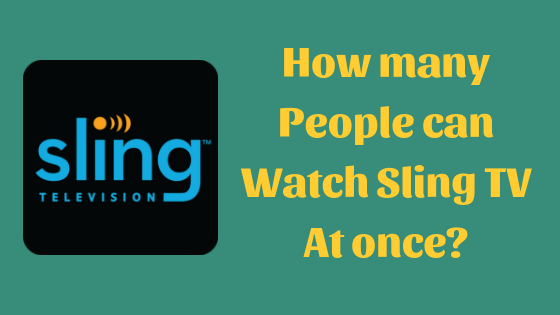 If you are subscribed to Sling Blue, then answer to how many people can watch Sling TV at once is three. Yes, you can stream through three devices at once with Sling blue plan. However this plan may not have the channels you want to watch. Sling Blue plan is the best option for sharing account with others. You can buy a Sling Blue package and share this account with your family. You can add as many devices you want with one Sling TV account but only three concurrent streams are allowed. As mentioned earlier, Sling Orange and Blue package is the combination of those individual packages. You will get all those channels combined in this packages along with the number of concurrent streams. We can enjoy up to four simultaneous streams with Sling Orange and Blue package. This is also a very good option for shared users with good number of channels. There are many other customisation option available to add along with this plan. Note: With Sling International services you can watch only one stream at once whereas with Sling Latino core services you can enjoy up to two streams at once. Sling TV is initially available for only Web and Android/iOS applications and then it expanded to almost every platform. Here is the list of devices where you can watch Sling TV on. Because of the content copy rights and limitations, Channelmaster users cannot record any videos with Sling TV App. Both Sling and Hulu are the major players in OTT industry. They do have major channels listed on their portfolio. However there are few significant different when coming to stream quality, price and number of devices streams can be played at once. Here in this section we will compare price, stream quality and number of devices you can watch hulu and sling on. Out of available two packages with Sling, Orange and Blue, you can choose the most relevant one to your interests. Both sling Orange or Sling Blue are available at $25 per month. If you want bundle pack which contains both Sling Orange and Sling Blue, you have to pay $40 per month. You can pause the video on most of the channels. Additionally you can avail DVR cloud 50 hours storage per month at $5. For the number of the simultaneous streams, refer to the detailed guide mentioned earlier. On the minus note, Sling have strict no refund policy. If you have taken free trial for 7 days and forgot to cancel, then you will be charged with subscription fees and you can’t get refund for that. Hulu offers you the packages with relatively low price compared to Sling. Streaming quality with hulu also getting good. Initially it was a big issue but now they have rolled out 60fps for most of the channels. Hulu has most of the local sports channels available in their platform. It’s getting bigger and popular with Hulu Originals. Coming to the number of simultaneous streams – here is the complete guide – How many poeple can watch Hulu at once? How many Devices / Streams Sling TV allows? There is no limitation on number of devices you can login with one Sling TV account. However there is a restriction on number of concurrent streams being played. It all depends on your subscribed Sling TV plan. If you have Sling Orange pack, then you watch only one simultaneous stream whereas with Sling Blue, you can have three streams at once. You can get almost all popular live TV channels listed on Sling TV platform. You just need to checkout in which package the channel you want to watch is present and then go for it. Yes. Most of the local channels like ABC, CBS, FOX, NBC are available for free with HD Antenna. For watching Bravo, BET, NFL, CNN and FX you need sling subscription. How many TVs can Watch Sling Account? No restriction is there on logging into multiple tvs with one Sling TV account however limitations are present on number of simultaneous streams. How to watch Sling TV on Apple TV? Just download the Sling TV app from Apple TV store. Sign up with your details and get 1 week free trial. If you are satisfied with the services, you can avail monthly premium subscription. How much is Sling TV a month costs? Sling Orange or Blue plan costs you 25$ per month. If you want both plan combined, it will cost you $40 a month. Do I need internet for sling tv? Yes, you need minimum 5 MBPS speed broadband connection for watching sling tv. However 20 MBPS speed is the recommended one. Can I watch Sling TV on my phone? Sling TV app is available for Android & iOS platforms as well. You can download the app from Google playstore or iOS app store to start watching Sling TV content. Is ABC on Sling TV? Sling TV recently added ABC channel to it’s list. You can get access to it if you subscribe to Broadcast Extra addon package for $5 a month. Is FOX on Sling TV? Yes. Fox is on Sling TV with Sling Blue plan. It is not available in Sling Orange package. Does Sling TV work with Roku? Yes. Sling TV works well with Roku. It is even offering stunning offers for Roku. When you subscribe and pre pay 2 months subscription fee, you will get Free Roku Express. Sling TV provides you online cancellation option. On the account settings page, click on Cancel subscription option and provide the reason to continue with the cancellation process. Things are getting turning around for Cable networks. There are many more online live streaming services are entering into this space providing best service at much cheaper price. All you need is a stable internet connection for a seamless TV experience. So with this I’m wrapping up this blog post on How many people can watch Sling TV at once? or How many devices you can watch Sling TV on or How many users can watch one Sling TV account. Hope we have clarified all your queries. If you still have any, do let us know through comments. Cheers!